The Witherspoon Whiskey Cocktail Series is here! Made with our Witherspoon Whiskey Texas Straight Bourbon. The Old Fashioned, is our proprietary recipe of this classic cocktail and is the perfect combination of straight bourbon, sweetness, bitter, orange and just a hint of cherry. This wonderful, ready-to-drink sipper can be enjoyed neat or on the rocks! 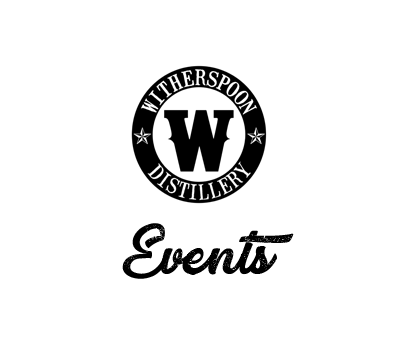 Here at Witherspoon Distillery we offer several types of events for guests to take part in. We offer Public Events for the whole family, behind-the-scenes Tours each weekend, and Private Events for large groups looking to entertain at a unique location. Most Friday and Saturday nights Witherspoon Distillery provides a Craft Cocktail list, a full bar, and plenty of "mocktail" options for everyone to enjoy. See our Calendar of Events for specific dates including live music, karaoke nights, tastings and pairings, food trucks, and so much more! Each week, several tours provide guests with an inside look at making whiskey, from grain to glass. Experience the details of small batch craft distilling. Tours are approximately one hour long and conclude with a sample of Witherspoon Distillery spirits and our famous rum cake!